Who came from a far land. Though here it’s the goddess who’s “chanting a prayer”, the bard has invoked her with song — his own prayer. And he’s gone to the “well in the wood” full of intention. Maybe not specifically to see the goddess, but knowing the tree and the well and the moment offer possibility waiting for human consciousness to activate. A gift of the gods, already given freely to us. Here in Vermont a light snow falls as I write this, and I step away from the keyboard to take a picture. By February here, snow itself can signal spring to come. You can feel the longer light, and moments of snowy beauty remind you that wonder is never far away. The sap will be running soon in the maples, the sugar shacks smoking all day and night as the sugarmen boil down the sweet juice to syrup. Green will burst forth, improbable as that seems right now in a world of cold whiteness. So Brighid comes from a “far land” that is also always near to attention, intention and devotion. Here across the Pond from the Celtic homeland, some North American Pagans can feel removed from the “gods of Europe”, bewailing their distance. This place, we can feel, isn’t “Their” land. Yet anyone who’s encountered a spiritual presence knows that place is a convenience of the gods, not a requirement — a set of clothes, not the being who wears them. Yes, it would be splendid, we imagine, to visit that “tree by the well in the wood”, simply by stepping out the back door to a landscape steeped in stories and legends of the goddess. Yet we also know what familiarity breeds. Or as an African proverb has it, “Those who live nearest the church arrive late”. The old saying that the gods like the offering of the salt of human sweat means effort is not wasted, devotion is repaid. Always, we have something we can offer them. And the gods give, but “not as the world gives”. But wait, you say. Isn’t that just what we’re doing with ritual and song? It’s really not a matter for argument, unless you need the exercise. Damh the Bard knows Brighid — you can hear it in the song. And out of love he’s traveled many times to the tree by the well in the wood. Brighid knows his name. This, then, is one intention to cherish: may we serve them so that the gods know our names. Not to hold it up before others like a badge of pride, but as a spiritual resource to treasure and spend at worthy need. Or as Gandhi said, “If no one will walk with you, walk alone” knowing in truth you aren’t alone. Ten years ago I didn’t honor Brighid. I didn’t “believe” in her, though I’d heard her name, thanks to all those who kept it alive in our world. Now I honor her, but I still don’t trouble myself about “belief”. Instead, I take the hint and look. “I saw her reflection in the mirrored well”, Damh sings. I tied it there to the tree by the well in the wood. Spiritual fire kindles in us at such moments. A blessed Imbolc to you. For me, that’s where Druidry starts, not in belief, but in love and experience of the natural world and the land we live on. Recently a visitor to this blog pm’d me to comment on what he perceives as the need for a Druid theology. It’s easy enough to feel that way, surrounded as most Pagans and Druids are by a larger culture still shaped by a religion where creeds matter much more than they do in Druidry. My correspondent acknowledges he’s a solitary, and such a path can indeed be lonely at times. Alone, I may confront myself more directly and disconcertingly. Alone, I face truths that can be uncomfortable, inconvenient — and profoundly useful to discovery, creativity and growth. Groups can conceal and divert us from the necessary work of the self. Yet one of the benefits of experiencing group practice is the reminder of the energies we all encounter and work with (or ignore). Yes, we can experience them all in solitary practice, sometimes more personally, vitally and intensely than in a group. Alone, I can move at my own pace, honor and learn from and serve the beings who speak to me, focus on what is meaningful and what lives within and around me. But attend a Druid group event and you’ll find one of the hallmarks of Druidry is a wide diversity of belief arising out of that practice and experience. Such belief is almost always secondary — important certainly, coloring experience and shaping behavior, influencing interactions with others, nourishing opinions, and clarifying decisions about future practice. Standing together in a circle with your Tribe, belief matters much less. No one asks for a recital of your beliefs as part of any ticket of admission, or denies you because you don’t “believe in” the Morrigan, or you believe that the universe is a berry carried in the mouth of a trout swimming in a much larger ocean. After all, there are days I don’t believe in myself. We face the altar, feel the sun and wind on our faces, acknowledge the always-turning year, hear the ritual words, and encounter through all our senses the reality of a marvelous cosmos alive with presences, forces and powers anyone can experience. Polytheists, animists, atheists, duotheists, monotheists, henotheists, eclectics, chaos magicians consciously selecting beliefs appropriate to their goals at the time — in the face of such variety, what can a Druidic theology say about belief in deity, the core of most credal religions — which Druidry clearly isn’t? What would such a theology achieve that Druidry doesn’t already have? “Why do we use the same ritual each year?” ask some of the regular attendees at the East Coast Gathering. Well, we do and we don’t. One common and shared autumn ritual during a weekend filled with name ceremonies, grade initiations, peace rituals, workshops, songs and the ritual of eating together with new and familiar people isn’t too much to ask. Because it’s a ground form, a common experience for everyone, nothing too daunting for a first-time attendee, whether OBOD member or visitor, familiar to the experienced ritualist who can fine-tune the ritual pacing, catch the moment when a squadron of hawks soars above the Gathering, or a cloud of dragonflies visits the circle, or owls hoot in the woods. The wind lifts from the east at exactly the moment East is invoked, and everyone can share the connection. The same summer I was on Lewis, a new edition of the Oxford Junior Dictionary published. A sharp-eyed reader noticed that there had been a culling of words concerning nature. Under pressure, Oxford University Press revealed a list of the entries it no longer felt to be relevant to a modern-day childhood. The deletions included acorn, adder, ash, beech, bluebell, buttercup, catkin, conker, cowslip, cygnet, dandelion, fern, hazel, heather, heron, ivy, kingfisher, lark, mistletoe, nectar, newt, otter, pasture and willow. The words taking their places in the new edition included attachment, block-graph, blog, broadband, bullet-point, celebrity, chatroom, committee, cut-and-paste, MP3 player and voice-mail. As I had been entranced by the language preserved in the prose-poem of the “Peat Glossary”, so I was dismayed by the language that had fallen (been pushed) from the dictionary. For blackberry, read Blackberry. And so I submit that it’s always good to know what you believe, as a way of doing what Carr-Gomm describes: honoring the unique form of your spirituality. Get it down in writing for yourself, grapple with it — and keep it on hand so you can revise it as your life takes you in unseen and unforeseeable directions. But never suppose it can serve you as a club to beat others “for not doing it my way” unless you want others to beat you with theirs. Why let a belief-reaction, a secondary response to the primacy of experience, dominate my consciousness? No, thanks. Beliefs change. Any religion which rests on a credal foundation will always be rocked by a world that shifts beneath it, by words that will forever need updating as understanding changes, by a nagging sense that reality stubbornly persists in not conforming to belief. Rather than blaming Satan or some evil Other, Druidry looks at the world and strives to learn from it. Imperfectly, humbly, joyfully. /|\ I believe that to be alive is a chance, if I take it, to be part of something vastly larger than my own body, emotions, and thoughts (or if I’ve learned any empathy, the bodies, emotions and thoughts of people I care about). These things have their place, but they are not all. /|\ I believe this because when I pay attention to the plants and animals, air, sky, water and the whole wordless living environment in and around me, I am lifted out of the small circle of my personal concerns and into a deeper kinship I want to celebrate. I discover this sense of connection and relationship is itself celebration. Because of these experiences, I believe further that if I focus only on my own body, emotions, and thoughts, I’ve missed most of my life and its possibilities. Ecstasy is ec-stasis, “standing outside.” Ecstatic experiences lift us out of the narrowness of the life that advertisers tell us should be our sole focus and into a world of beauty and harmony and wisdom. /|\ I believe likewise that the physicality of this world is something to learn deeply from. The most physical experiences we know, eating and hurting, being ill and making love, dying and being born, all root us in our bodies and focus our attention on now. They take us to wordless places where we know beyond language. Even to witness these things can be a great teacher. /|\ I believe in other worlds than this one because, like all of us, I’ve been in them, in dream, reverie, imagination and memory, to name only a few altered states. I believe that our ability to live and love and die and return to many worlds is what keeps us sane, and that the truly insane are those who insist this world is the only one, that imagination is dangerous, metaphor is diabolical, dream is delusion, memory is mistaken, and love? — love, they tell us, is merely a matter of chemical responses. /|\ I believe that humans, like all things, are souls and have bodies, not the other way around — that the whole universe is animate, that all things vibrate and pulse with energy, as science is just beginning to discover, and that we are (or can be) at home everywhere because we are a part of all that is. /|\ I believe these things because human consciousness, like the human body, is marvelously equipped for living in this universe, because of all its amazing capacities that we can see working themselves out for bad and good in headlines and history. In art and music and literature, in the deceptions and clarities, cruelties and compassions we practice on ourselves and each other, we test and try out our power. This last weekend marks the 5th East Coast Gathering I’ve attended, the 6th since its launch in 2010, and another gift of Spirit and mortal effort. You can read my accounts of three of the previous years: 2012 | 2013 | 2014. A special thank-you to John Beckett, several of whose professional photographs illustrate this post. 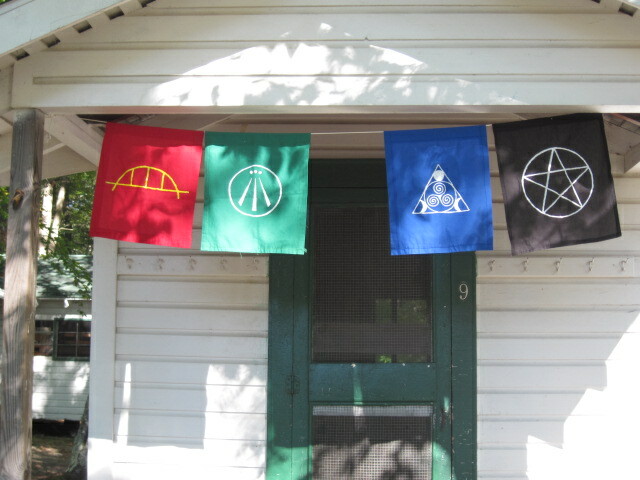 You can visit John’s own articulate and insightful blog “Under the Ancient Oaks: Musings of a Pagan Druid and Unitarian Universalist” over at Patheos here. Registration for the weekend filled within 20 hours of opening this last spring. 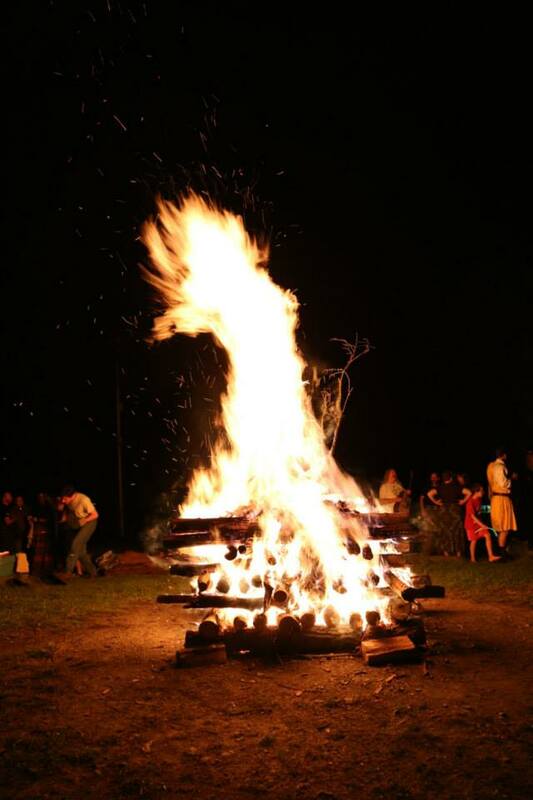 Gatherings like this answer an obvious need in the Druid and Pagan community, and more are in the works in other locations. It’s on us to help make them happen. A dedicated team can bring the same joy, support, inspiration and community to other regions. Yes, we’re all solitaries some or much of the time, but every solitary benefits from celebrating and learning in the company of others. That chance conversation, ritual insight, day- or night-dream, word or phrase that lights up just for you, the hugs you give and receive, the opportunities to serve the community through offering a workshop, cooking, cleaning, organizing, driving — these make Gatherings like this such richly rewarding experiences. The dark and light halves of each year are real, and we need all the help and laughter we can find to thread our way through the labyrinth of time. I arrived Thursday afternoon early enough to check in and unpack before the opening ritual. 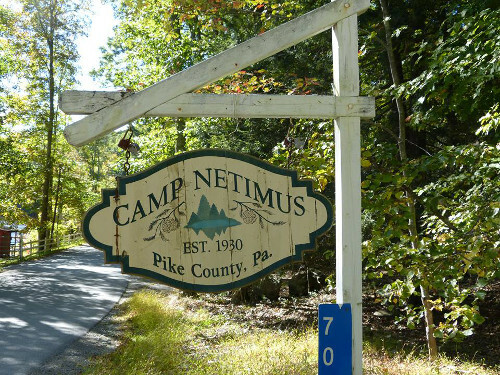 My cabin mates had already hoisted a banner, which also made the building easier to distinguish from the others in the dark, when the “9” on the door was no longer readily visible. 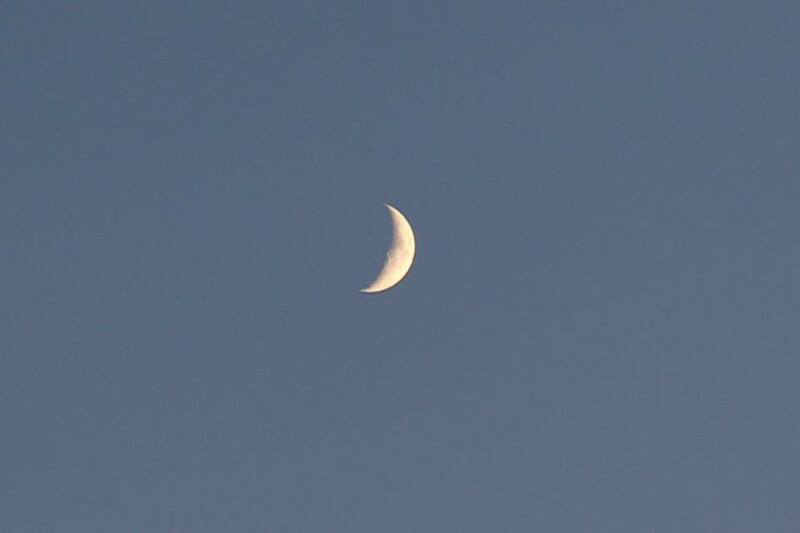 Equinox marks the shifting energies of days and nights, rebalancing the world. 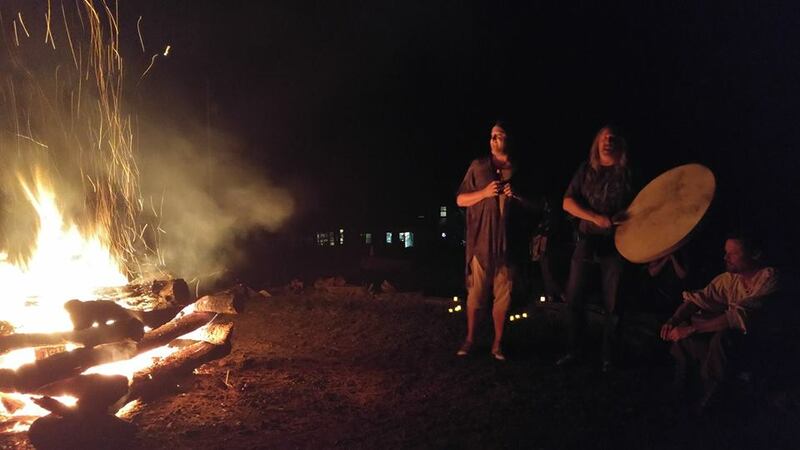 A lovely moon bore witness, waxing each evening through wonderfully clear skies, lighting the path to evening events like the Ovate initiation ritual and illuminating the short uphill walk from the cafeteria to the nightly fire circle. 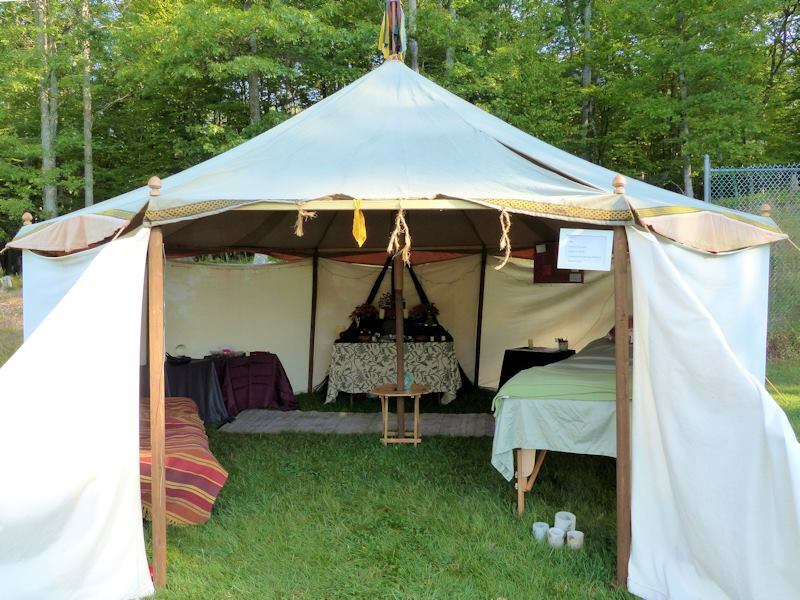 The theme this year was ritual, and the whole weekend focused our attention on its magical possibilities through a dozen workshops, demonstrations and ceremonies. You can get a sense of the range of approaches from the list of workshops here. We also welcomed returning U. K. guests Damh the Bard, Cerri Lee, and Kristoffer Hughes. 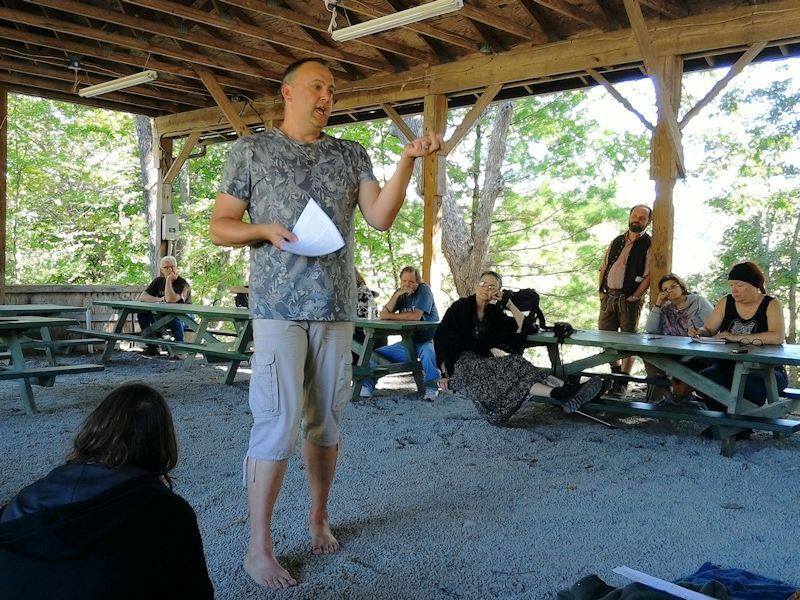 Damh’s workshop on “The Bardic Voice” underscored the centrality of the Bard in Druidry. 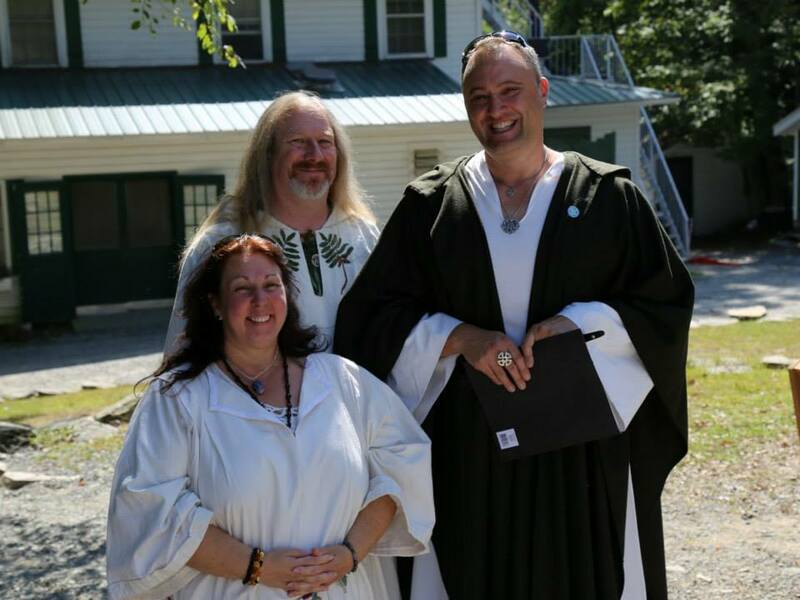 Like many Druid groups, OBOD orders its teaching in the sequence of Bard, Ovate and Druid. But they do not form a linear progress or erect a hierarchy of achievement. They spiral. In an Ovate breakout group a day later, several people mentioned how they often return to the Bardic coursework, its insights deepening through their Ovate practice. And likewise with the work of the Druid grade. Reminders of ritual possibility filled the weekend. Below is a picture of a labyrinth, another gift of the weekend, lovingly constructed by Cat Hughes and friends. Labyrinth by day — entrance. Photo by A Druid Way. 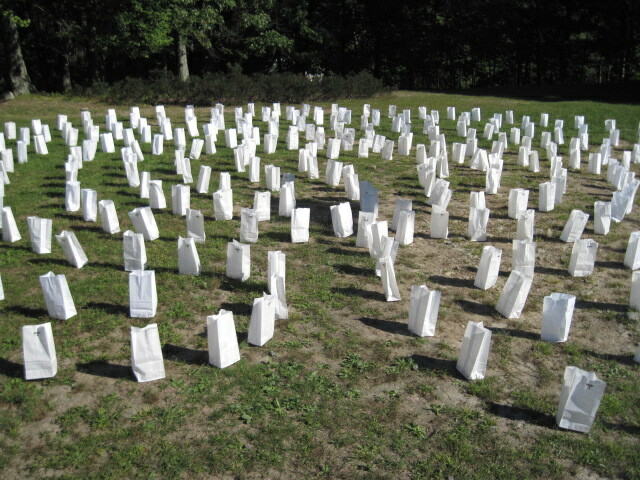 Volunteers switched on each light every evening, then turned them off again when everyone else had gone to bed. Labyrinth by night. Photo courtesy Damh the Bard. Kris’s workshop, “Laudanum, Literature and Liturgy — the Ritual Legacy of Iolo Morganwg,” featured the ritual — in Welsh — that Morganwg first performed on the Summer Solstice on Primrose Hill (London) in 1792, launching the Druid Revival and establishing the Welsh Gorsedd of Bards. Morganwg is also the author of the Druid’s Prayer, still used in many modern Druid groups including OBOD, and a major influence on generations of Druids from his time to the present. 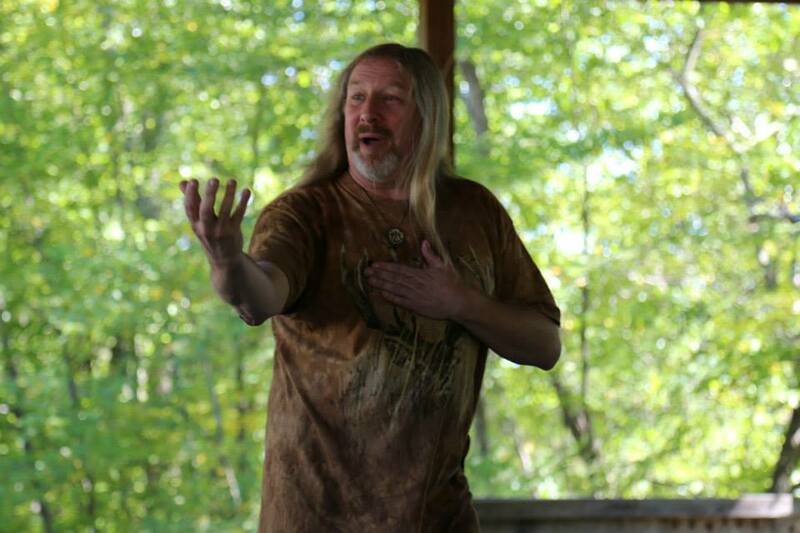 Kris’s Celtic eloquence in praise of Morganwg and his passion for Druidry took him off script and left many of us with tears in our eyes. Kris during his workshop on Iolo Morganwg. Photo courtesy of Dana Wiyninger. Bill Streeter from the Delaware Valley Raptor Center, the charity designated for this year’s Gathering donation, brought six birds and made a fine presentation on raptors, their abilities, the dangers (mostly human) facing them, and the challenges of rehabilitating injured birds. 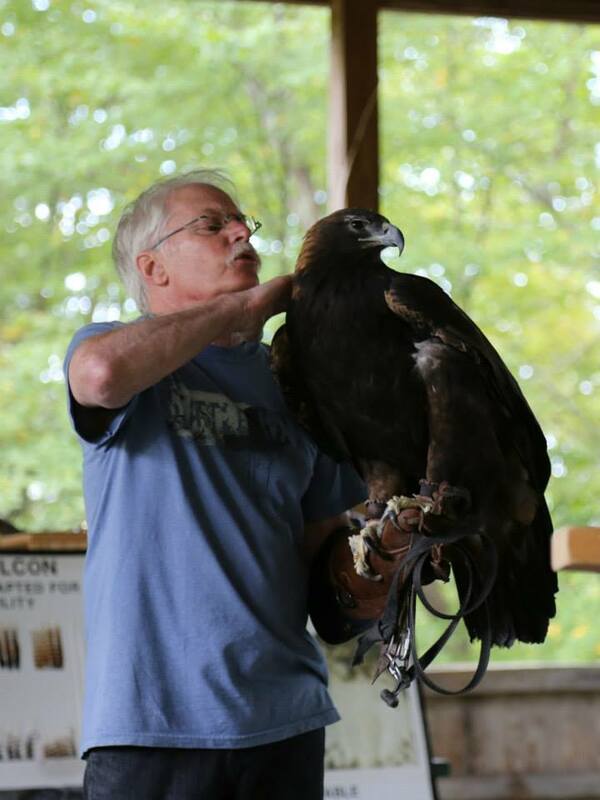 Bill Streeter of the DVRC with a golden eagle. Photo courtesy John Beckett. 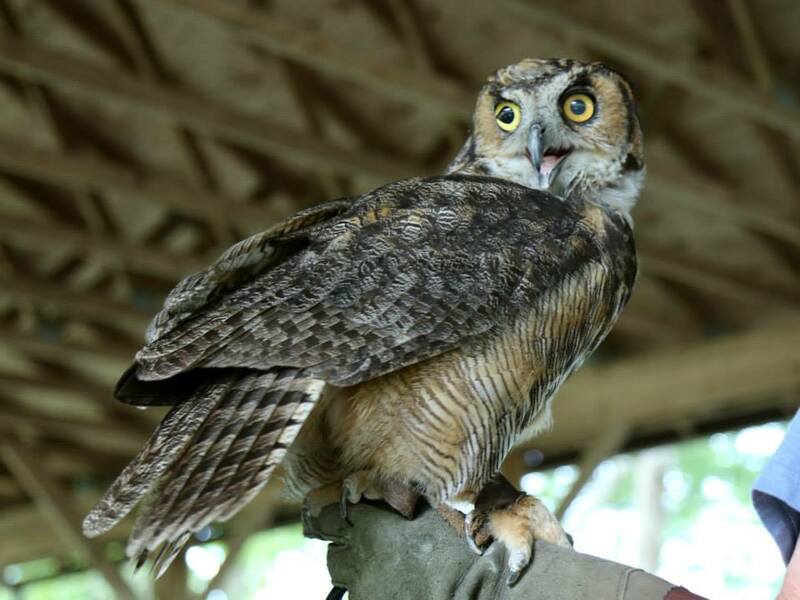 These magnificent birds have often suffered neurological injuries that worsen over time. Though both the eagle above and the owl below look normal, both are blind in one or both eyes, or suffer other injuries like crippled wings, and thus could not survive in the wild. But the birds help save the lives of their kin through their appearances in info sessions like this one. Great Horned Owl. Photo courtesy John Beckett. The Alban Elfed ritual celebrating the Equinox includes gifts from children, guests and each of the three grades of Bards, Ovates and Druids. 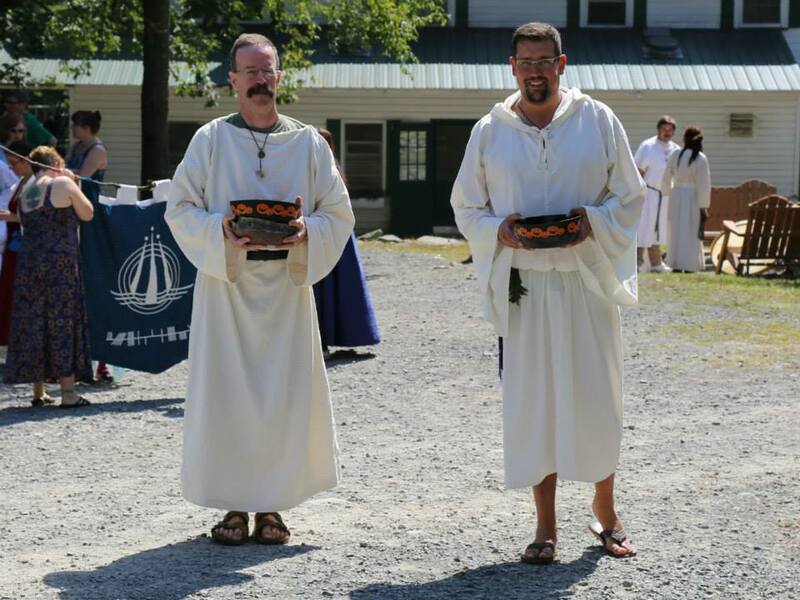 Here are Chris and I holding bowls of acorns, part of the Ovates’ ritual gift, just before the ritual procession into the Circle. Chris (r) and I (l) just before Alban Elfed ritual. Photo courtesy John Beckett. The evening eisteddfod (music and poetry circle) one night featured a splendid duet from Kris and Damh — see the image below. Kris and Damh singing at the fire circle. Photo courtesy Hex Nottingham. 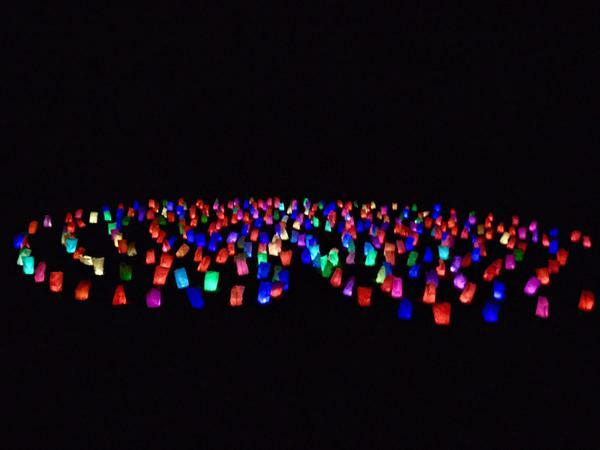 Below is another pic of the fire circle one night. Our enthusiastic and skilful fire-makers Derek and Brom love large, carefully-constructed bonfires. Evening bonfire. Photo courtesy John Beckett. Once again Dana set up her meditation tent on the campground for all to visit and enjoy. 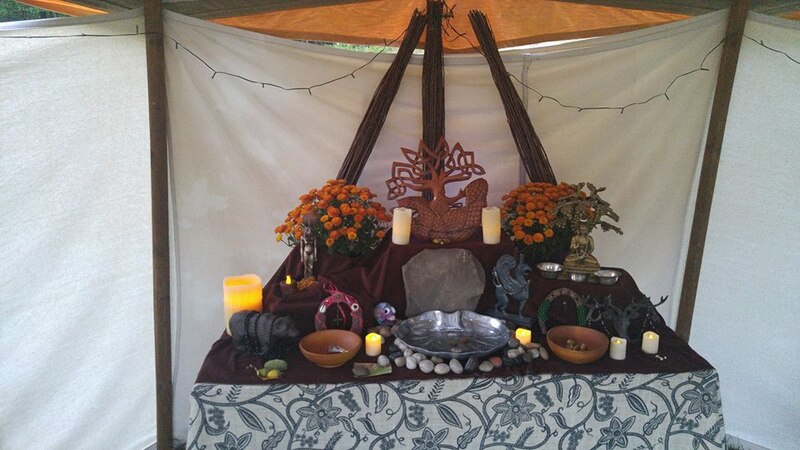 Altar in Dana’s meditation tent on the camping field. Photo courtesy Hex Nottingham. A small group made a side excursion to nearby Raymondskill Falls. Here’s a view of one of the waterfalls. 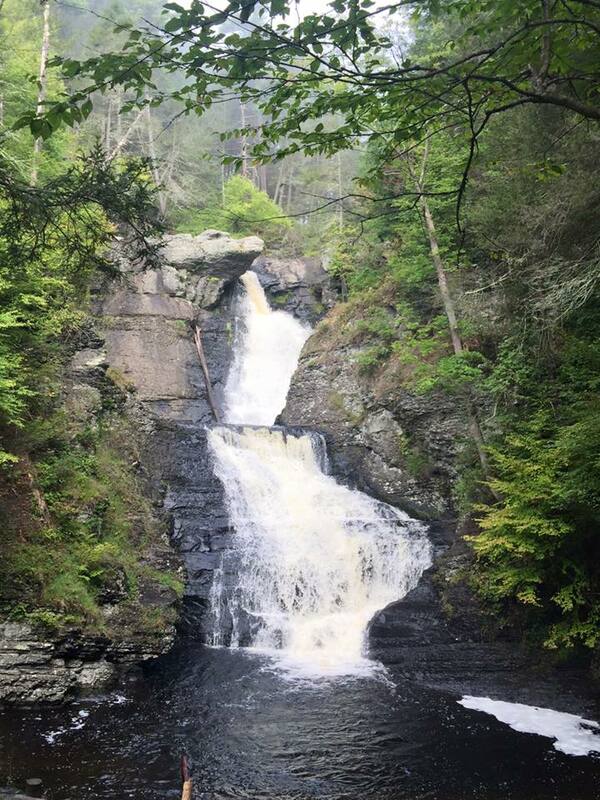 Raymondskill Falls. Photo courtesy Gabby Batz Roberts. And for those of us who can’t wait an entire year, the Gulf Coast Gathering will celebrate its second year in March 2016. Blessings of the Equinox to all!